Or, you know, don’t. Hang up there and then, because I know I’m not the only one that hates going through the painful task of ringing a company, only to discover the endless number-pressing phenomenon. Wouldn’t it be nice if you could ring a bank, or an office, or even the phone company themselves, and speak to a real living, breathing, human being who knows exactly what you need, what you need to do, or who you need to speak to? Why yes, yes it would. According to the Australian Bureau of Statistics, remembering that this is a government run database, the current unemployment rate is 5.8%. That’s approximately 710 000 people who could potentially sit and answer your prayers. Literally…well, your calls at least! The reason I bring this up is because yesterday my Dad rang Foxtel, because downloading a movie wasn’t working. After going through the various numbers relevant to his enquiry, he was finally connected to a real person. He explained his problem and the lady then asked him for his details, claiming that he isn’t the authorised person since my mother’s name is on the contract. “I don’t want to access my account at all, I don’t need to be authorised, all I want to know is why the movie won’t download,” he said. My mum then had to get on the phone and give the okay (like you could tell it was her anyway) and the woman on the phone informed him that she would have to put him through to someone in another department because she didn’t have the answer. “I can’t download a movie for some reason, it won’t process,” Dad said. The man on the other end said that this was a known problem, a lot of other people had called about it and they are working on getting it fixed. All that for one simple answer. Now, shouldn’t the line have gone straight through to a person? The first woman answering the phone straight away; containing full knowledge of her company and their current situation. Shouldn’t she be in the loop? “I’m sorry sir, that is a known problem and there’s nothing we can do about it at the moment,” was all that needed to be said. Half a minute on the phone and bang, the call is over. The last time I rang member’s equity bank, I went through about 6 of these button-pressing dramas before I got to speak to a real person. All I wanted to know was whether I could purchase a debit card for use online (to support my online-shopping addiction, it’s really getting out of hand) connected to my existing daily account. Twenty minutes later I am told that no, no I cannot purchase a card with that account, they are only available with an InterestME account; or something of the sorts. But not to worry, my call wasn’t entirely pointless; the man I spoke to was happy to change my address in their system for me since I had moved house. How kind of him! He must have failed to click save, though, because I am still receiving countless letters in the mail redirected from my old address. No-where on their website or through online banking do I have the option to stop the mail, either. They can spend the money on the paper, though, because there’s no way I’m going through a pre-recorded voice again, only to be disappointed. Reminds me of that episode of friends where Rachel tells Ross that she’s pregnant. If you haven’t seen it, I suggest that you do. In the episode, Ross doesn’t understand how Rachel could have got pregnant because they used a condom. She then informs him that they only work 97 percent of the time. Ross gets really worked up after that (which if you know his character is super entertaining). “Ross maybe we should just talk later,” Rachel says. Ross is hysterical, “No no, I want to talk now,” he says. “In fact,” he picks up the phone, “I want to talk to the president of the condom company.” Rachel goes to leave, “Shhh,” Ross says and they wait for the phone to ring. 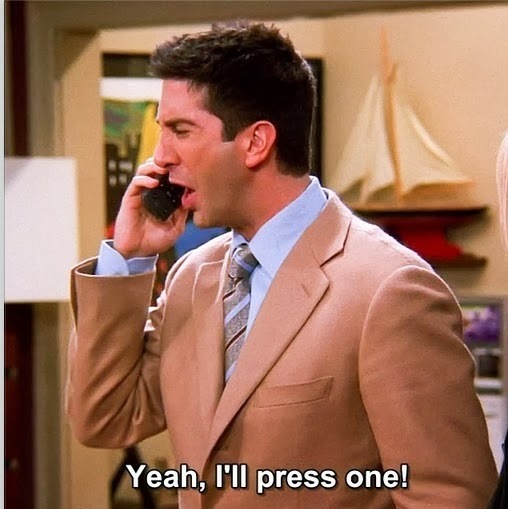 He bursts out, “Yeah I’ll press one!” A perfect sitcom demonstrating the auto-voice phone dilemma that so many of us face. Once I called a company and ended up waiting for the “Press hash” signal because none of the above options concerned me. The only thing worse than that is being put on hold with terrible background music playing while you wait. Always happens at the doctor’s surgery, whose message tone also doesn’t even contain their opening hours, but that’s an entirely different story altogether. It’s moments like these you need… Minties! Australian Bureau of Statistics. 2013. Labor Force Australia, Oct 2013. October Key Figures – Unemployment rate, Unemployed persons http://www.abs.gov.au/ausstats/abs@.nsf/mf/6202.0 Accessed Oct 17. PureBloodPaul. 2013. Friends – HD – Rachel Tells Ross She Is Pregnant. The One Where Rachel Tells S08E03. Warner Bros Television. http://www.youtube.com/watch?v=1HkqeORgn_U Accessed Oct 17.